Because Mars is a natural malefic, it can bring difficulty when sitting in the first house. Aggression, anger, a hot temper, independence, rashness, and liberalness will all characterize the native. This tendency towards recklessness can cause a tendency towards accidents. While on the positive side, this placement gives confidence, bravery, courage, and adventurousness, it also makes the native unhappy and lack self-love. The body will sustain many injuries, but it will have the strength to recover from them. Diseases of the blood can also plague these individuals. Mars will make the native very contentious, and there will be relationship struggles for that reason. Their sexual nature will also make it hard for them to maintain monogamy. Strong technical skills are seen in these natives, and profession such as engineer, mechanic, accountant, and lawyer are supported. Sports are an area where these natives will excel, as they greatly enjoy competition. Military work will be among their interests. If well placed, Mars can make them thrive in this field as a leader. Married life can be difficult unless their partner has a similarly strong Mars. If Mars is in the first house in the sign of Capricorn, Aries, or Scorpio, the native will gain happiness, fortune, success, respect, and will enjoy life’s pleasures. Courage, a good disposition, fame, and leadership are also seen. The native will come from a good family that gives them a favorable start in life. In the sign of Cancer in the ascendant, Mars brings much ill health to the native. There will be impurities in the blood, gas, or indigestion. People will find him or her ugly, and there will be a tendency to be accused and charged in court if other factors align. Argumentativeness and a cruel-heart are found in these natives. They are also blunt, gross, insensitive, and tactless. Difficult qualities like these lead to lacking honor or fame in life. Confidence and self-respect will be lacking. Important Note: For Cancer ascendants, Mars rules the 5th and 10th house, making it a very favorable planet. Even if debilitated, Mars will still give some good results for Cancer ascendants. Because of its exaltation in Capricorn, as a sign ruled by Saturn, Mars will also do well in Saturn’s other sign, Aquarius. During the 28th year of life we feel the full effect of Mars. There will be problems at this time if Mars rules difficult houses or is afflicted. This is the best position for Jupiter because it receives directional strength in the ascendant. This placement gives enormous benefit to the entire horoscope. In fact, this is widely accepted to be the best placement of a planet in a house. It brings beauty, happiness, health, fame, respect, a spiritual nature, longevity, and luck. Because the 5th, 7th, and 9th houses are aspected, the native’s children, spouse, and father will also bring them much happiness. Divine blessings protect these natives from suffering. He or she will always be do good deeds, and be dignified and wise. World famous people and spiritual leaders often have this placement in their chart. As they get older, there may be a tendency towards gaining weight. If in the signs of Cancer, Pisces, or Sagittarius in the ascendant, Jupiter’s affects will be multiplied. Fame and honor will certainly come, unless Jupiter is receiving seriously negative aspects. The native’s life will abound with luxury and comfort. This position indicates that the native is highly spiritually evolved. When Jupiter sits in Capricorn in the ascendant, the native will have allergies, liver problems, and other health issues. In general, the person feels negative and unhappy. Honor and fame are lacking and the individual will be a scapegoat. Although they will pretend to be religious and spirituality, in reality they won’t be. Longevity will be less for this native, and a strong sense of dogmatism and self-righteousness is seen. Self-esteem also suffers due to this position and lack of wealth is seen as well. Jupiter’s full results are given at 16 years of age. 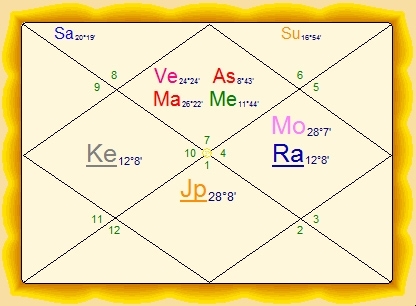 During this year the native will receive many benefits unless Jupiter is badly aspected or rules a difficult house.